Other than having a good bed and a quality mattress, buying a decent mattress protector is a bedding essential that offers a wide range of benefits. A protector keeps the mattress stain-free and nicely protected along with drawing moisture off you, to make you sleep comfortably all through the night. It helps your mattress to remain new and disinfected for a longer duration, and reduces general wear-and-tear. The protectors are very convenient to use. It can be easily removed and can be used right washable. We already have written a complete guide about Best memory Foam Mattresses. Mattress protectors are available in different types. These work as encasement that defend the shields of the mattresses from direct attack of bed bugs and dust mites and are mostly used in hotels and also in homes. These also protect the mattress from getting wet due to water and bed-wetting babies. Fitted: The fitted mattress protectors look much like a fitted sheet. A fitted mattress protector can slide over the mattress ends and edges. Elastic Strap: The elastic straps mattress protectors have an elastic strap that can be fitted over all the corners of the bed mattress. Zippered: The zippered mattress protectors are such that entirely cover the mattress, performing as a defensive shield over both the sides of the mattress. It is much like a pillow cover that encases the mattress from all the sides. Dust Mite Mattress Protectors: Dust mites are small organisms feed on human skin. They are the source of different allergies. Mattress protectors that have dust mite protection usually possess antimicrobial treatment to provide a shield against these mites. Mattress protectors that have big pores may allow the dust mites to enter into the sheets. Waterproof Mattress Protectors: The mattress protectors that use waterproof fabric offer shield from bed getting wet due to sweating, bed-wetting babies and water etc. Users who have babies and small kids can benefit from this type of waterproof protector having a breathable lining that prevents and locks the moisture from entering the mattress. 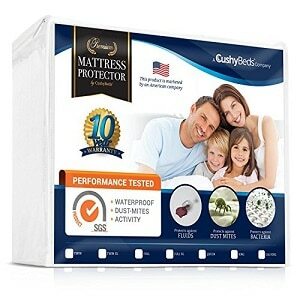 Bed Bug Mattress Protectors: These mattress protectors have zipped covers that surround a mattress completely. They protect the users from bed bugs that are prevented from entering the fabric of a mattress. 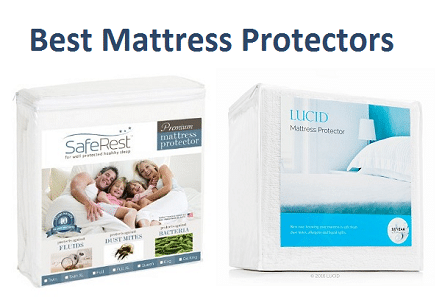 Bed bug mattress protectors are generally made up of a thick synthetic material like polyester that does not let the bed bugs to enter through the mattress fabric. Polyurethane mattress protectors: These protectors are supple and waterproof types, integrating a breathable medium that prevents getting disturbed in sleep by annoying noises, unlike other conventional mattress protectors. Polypropylene mattress protectors: Polypropylene mattress protectors are very light in weight, but amazingly strong and have less moisture absorption. Thus, these types are resistant to moisture and stain and are easy to clean due to light weight. Size: Mattress protectors are available in various sizes like king size, California king size, queen size, etc sizes; buy the one that fulfills and suits your specific needs. Hypoallergenic: If the user is allergic or sensitive to a certain fabric material, opt to buy a hypoallergenic protector. Thread count: The luxurious mattress protectors have a higher thread count. Pore size: Mattress protectors having a pore size of eight microns and less are better than the others. Easy washing: Make sure that the protector is either easy to wash using a washing machine or can be wiped off using a cloth. Breathability: A protector that can breathe aids in keeping it breezy, cool and soothing. 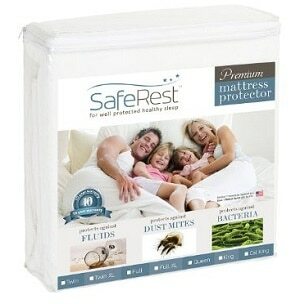 The king size SafeRest Premium Hypoallergenic Waterproof Mattress Protector comes in size of (11.4 x 10.8 x 3.9) inches. The product has got an approval from the FDA. The SafeRest mattress protector is well known for its waterproof feature. It has an excellent waterproof membrane layer that effortlessly absorbs the moisture and leaves a dry surface for comfortable sleep in any of your best innerspring mattresses. This is the best option to go for if you have small kids at home as it offers good protection to your mattresses from getting damped by bed-wetting or spilling of water and fluids. The mattress protector is perfectly ideal for people who are hunting for an excellent quality protector that serves as a shield from stains, spills, and allergens at affordable prices. The mattress protector is known for its waterproof attribute. It has a waterproof membrane layer that easily absorbs moisture and leaves a dry surface. Maintenance of this protector is really easy as it can be machine-washed along with other stuff using normal regular detergents that are free from bleach. You can spread it outside to dry. And do not use iron. Waterproof and best option if you have kids. Comfortable with waterproof and hypoallergenic features. Sides of the mattress protector look thin. Might undergo wear and tear. Luna uses the most modern undetectable sleep technology and offers a range of mattress protectors that provide protection against dust mites, moisture, urine, and sweating. This makes Luna protectors particularly helpful for people searching for protectors that shield their mattresses and offer good health benefits as well. The queen size Luna mattress protector is of dimensions (60 x 80 x 18) inches. The material of the mattress protector is smooth and soft to touch and also skin friendly. Unlike many other mattress protectors, it does not disturb your sleep by making any scrunching sound of plastic. The product is sold at a reasonable price and offers good service similar to most other expensive mattress protectors. The material of the protector is excellently breathable and offers a cool surface for a sound nap. The surface material is made up of soft cotton terry back encrusted with a breathable and hypoallergenic covering. 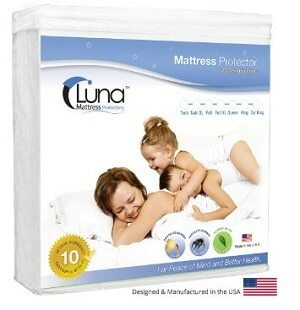 Users of Luna Premium Hypoallergenic Waterproof Mattress Protectors claim that the product is perfectly waterproof. And further, it guards the expensive mattresses against the fluid spilling. It is a good option for people having pets or small children at home. The material of the protector is breathable and offers a cool surface for a comfortable sleep. The surface material of these protectors is made up of soft cotton terry back encrusted with a breathable and hypoallergenic covering. The mattress protector fits nicely on any type of mattresses without gathering up or sliding over the mattress. The Luna mattress protector is easy to handle as washing and drying are not much a tough job. As per the reviewers, the protector adjusts well inside the washing machine and can bear certain heat that does not let it melt in the dryer. Material is soft and waterproof. No scrunching sound of plastic layer. Irksome extra fabric on the sides of the beds. Mattress cover is not much breathable. Too hot to sleep on. The fabric makes users sweat while sleeping for some time. The Lucid Premium Waterproof Mattress Protector offers you sound and clean sleep environment on a healthy surface. This protector comes with fitted sheet-style. It offers protection against dust mites, bed bugs, and allergens. It is also waterproof in nature, giving safety from fluid spills. It has dimensions of (54X75) inches. And, the product comes with a 15-years warranty. The mattress protector comes with waterproof technology that forces out all fluids and liquids from the surface, including sweat, urine and other spills without letting it get absorbed through the mattress. The product is easy to clean with washing machine using the regular household detergents. Hot water can also be used for washing. It is strictly restricted to use of bleach, ironing, and dry cleaning. The mattress protector is made of terry cotton fabric and offers noiseless and comfortable sleep to the users. The waterproof barrier has tiny microscopic pores of air to let in air through it and offer better breathability and a comfortable sleep atmosphere. The polyurethane backing guards against allergenic, dust mites, bed bugs and bacteria from housing inside your mattress. The waterproof technology pushes out all liquids, including body fluids like sweat, urine, and other spills without letting it get absorbed through the mattress. It is easy to wash with washing machine using normal household detergents. Hot water can be used for washing. It is restricted from use of bleach, ironing, and dry cleaning. The protector is made of terry cotton fabric that offers noiseless and comfortable sleep to the users. The liquid-proof barrier has tiny air pores to let air to offer better breathability and a comfy sleep atmosphere. It has polyurethane backing that guard against allergenic, dust mites, bed bugs and bacteria from the housing in your mattress. It is suggested to be safe if you have kids and pets. It comes with elastic fitted sheet style and has pockets made to house mattresses with a depth up to 22 inches. It has ultra-thin designed structure that is breathable and remains cool while sleeping on it. It lets you enjoy the feel of your mattress. Drying in the washing machine is not allowed. The protector gets wear and tear if used to dry in the dryer. 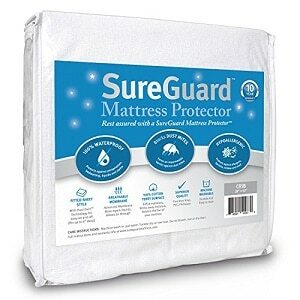 The SureGuard Mattress Protector is said to be 100 percent waterproof and provide an excellent shield against body fluids like sweat, urine, liquids, and stains. The product comes with a 10-year guarantee from SureGuard. It has hypoallergic features that provide protection against insects and micro-organisms. The product is tested independently in the lab and also certified by GREENGUARD Gold. The mattress protector is made from terry cotton material on its surface. This material provides a soft and comfortable sleeping surface to the users. The SureGuard Protector is very thin and extremely light in weight making it damn easy to handle. It is made up of a material that hinders the entry of dust mites, microorganisms, and bed bugs, thus offering safe sleeping surface. The mattress protector is free from Polyvinyl chlorides, Vinyl, Phthalates, and other lethal constituents. Hence, it is safe for use by kids and pets. It is very easy to clean using a washing machine and can be dried in its dryer. The SureGuard Mattress Protector is designed in the fitted sheet style with easily stretchable sides that fit with mattresses of any depth. The mattress is offered with a warranty to be replaced in case the users find it inefficient in any way. The protector is made of terry cotton material on the surface. This offers a soft and comfortable sleeping surface to the users. The SureGuard Mattress Protector is thin and very light in weight making it easy to handle. The mattress protector is free from PVCs, Vinyl, Phthalates, and additional toxic constituents, hence is safe for use by kids and pets. 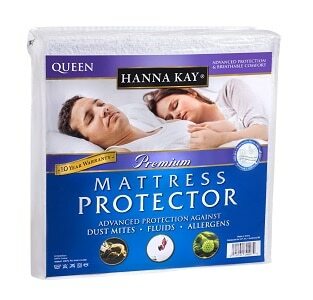 The protector material hinders the entry of dust mites, microorganisms, and bed bugs, thus offer safe sleeping surface. The protector is easy to clean with washing machine and can be dried in its dryer. The SureGuard Mattress Protector comes in fitted sheet style. Its stretchable sides fit with mattresses of any depth. Protection from dust mites, microorganisms, and bed bugs. Fluid may seep through the protector to reach and spoil your expensive mattresses. Produce disturbing noise on changing sides while sleeping. 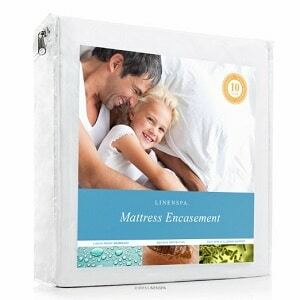 The LINENSPA Encasement Mattress Protector has zippered design that wholly covers your mattress from all sides and protects from bed bugs and other micro allergens. It has a layer of waterproof polyurethane material that prevents fluids and liquids from reaching your mattress. Also, protects the mattress against stains. The protector material is very smooth and soft. It is made up of fabric having microscopic air pores that make it breathable and offer a cool and comfortable temperature on the surface for sleeping peacefully. It also has a layer of a slender waterproof layer that has minute openings to let air to pass through and block liquids from passing through it. It also captures bed bugs and microorganisms for protection to the users. It is designed to fit on mattresses of nearly 12 inches depth. The material of the protector does not contain PVCs and vinyl constituents and is considered safe for children and pets. It also offers the convenience of washing the protector in washing machine using hot water and can be dried in the dryer. You may also tumble dry it on low heat. It is restricted from bleaching and ironing. Do not go for dry cleaning as well. It has a layer of slender waterproof film that has small pores to let air to pass and block liquids from passing through. It also prevents bed bugs and microorganisms for protection without compromising with the breathability. The protector material is soft. It is made up of fabric that has air pores making it breathable and preserves a cool and comfortable temperature on the surface for sleeping peacefully. The protector is such designed that it can be used to fit on mattresses of nearly 12 inches depth. The material of the protector is free from PVCs and vinyl constituents and considered safe for children and pets. It offers the convenience of washing the protector in washing machine using hot water and can be dried in the dryer. You may also tumble dry it on low heat. It is restricted from bleaching and ironing. Do not go for dry cleaning as well. It can also be cleaned just by wiping it off using a wet cleaning cloth. Have microscopic air pores that make it breathable. Easy to clean and dry in washing machine. Does not provide complete protection against bed bugs and dust mites. The material of the sheet is not very comfortable to touch. Vinyl-free protector is safe for children and pets. Its easy-care fabric makes it a great way to protect mattresses and pet beds from accidents. Protector is machine washable and dryer safe. The protector is made of soft jersey fabric that is very smooth and breathable. The waterproof protection layer helps to prevent the fluids getting into the top of the mattress and getting dirty. The product comes with fitted sheet-style and has a knit skirt pattern that adjusts with mattresses of up to 18 inches thickness. The protector is made of vinyl-free constituents that are safe for pets and kids. It can be machine washed and dried at low heat. The product comes with a 10 year warranty. The mattress protector has a 100 percent waterproof blockade under the jersey fabric that prevents the fluids, insects, microorganisms, and allergens. The waterproof membrane of the protector blocks the surface of the mattresses from getting stained by the spill of fluids. The mattress protector offers protection to your mattress against fluid spills, stains, and microorganisms to seep through the sheet. Beneath the jersey fabric, there is a waterproof blockade that prevents the fluids, insects, microorganisms and allergens very well. It is made up of jersey fabric which is extremely light in weight and soft in texture. It offers a breathable surface to sleep and that does not change the feel of your mattress. The product is made of materials that are free from PVCs and vinyl chemicals, thereby making it safe for the use of kids. The protector is made of fitted sheet style. Thus it easily fits and provides protection to the underlying mattress. The protector possesses an interwoven pattern and a pouch like a pattern to lodge the mattresses that are nearly 18 inches in depth. It is simple to insert and take out the covering for washing purpose. The mattress protector is very thin and flimsy in thickness. Might get wear and tear after several washes. Produce much sound when sleeping and changing sides. No 100 percent protection from the spills and bed-wetting. Hanna Kay Mattress Protector is made from an excellent terry cotton cloth and the back is supported by a waterproof surface membrane having small microscopic pores. The pores allow passage of air through them and make it breathable. The strong material of the protector allows sleep peacefully without producing any disturbing crinkly plastic sounds. The Hanna Kay mattress protector is made up of a thin layer of polyurethane support that does not allow the fluid stain from seeping through and spoil void your mattresses. Unlike its competitors, it does not use regular plastics materials that process disturbing noises and sounds while sleeping. The product comes with a 10-year warranty. The company offers a cash back guarantee to its customers in case they have complaints or any issues. These protectors are believed to be very soft and comfortable ones that are available in the market. These also have micro-pores that allow air to pass through making it breathable. These are made of the ultra-thin material of best quality offering the best sleeping experience. The mattress protector has a thin layer of polyurethane support that prevents the stains from seeping through and spoil void your mattresses. It does not use regular plastics materials that process disturbing noises and sounds while sleeping. The protector prevents any fluid or allergens from passing through the surface of the sheet. Hanna Kay mattress protectors are considered to be very soft and excellently smooth and comfortable protectors available in the market. These are made of the ultra-thin material of the best quality that provides best sleeping experience. It is not made from bamboo materials as like its competitors that may result in skin rashes. The protector prevents from dust mites, bed bugs, bacteria and other microorganisms from lodging in your mattress. Available in all sizes like Twin, Full, and King. Changes the feel of your mattress. Very firm and tight surface and does not offer comfortable sleep. Produce crackling plastic-like sound when you change position in sleep. The Premium Mattress Protector Cover by CushyBeds is designed to improve your sleeping condition, providing a super breathable mattress protector that is soft, comfortable and not disturbing. The CushyBeds mattress Protectors confidently guarantee the quality of its features. It also offers a 100 percent guarantee to refund the customers who are not satisfied with the protector for any reason. The material of protector is made of a high quality and good percentage i.e. about 80 percent of cotton and the percentage of terry cotton-polyester cloth as little as 20 percent. Thus, it provides skin friendly surface with a soft touch to sleep. CushyBeds Mattress Protector is made with the best quality of terry cotton fabric. The material of the protector is made of excellent quality back support that produces no disturbing sounds when you change your sides while sleeping. It lets you enjoy a peaceful sleep without any crinkling noises. Washing and handling of the mattress protector are damn easy. It is allowed to machine wash and use a dryer to clean the protector. The mattress protector is made of cotton and terry cotton-polyester cloth. It offers skin-friendly surface to sleep. The surface has a thin layer of a waterproof membrane having microscopic pores that allow air to pass through making it breathable. It does not use regular plastic membrane as a guard from spills. CushyBeds Mattress Protectors use 100% waterproof material that offers complete protection against the spill. The protector is made of a greater percentage of cotton and little percentage of terry cotton-polyester cloth. It offers skin-friendly surface with a soft touch to sleep. CushyBeds Mattress Protector is created from the best quality of terry cloth. The mattress protector has a thin layer of polyurethane support which protects the mattress from stains getting spilled through the sleeps and spoiling the mattress. Make crunchy sounds while sleeping that may disturb your sleep. The fabric used has rough texture to the skin. No padding, hence difficult to fix on the mattress. The Waterproof Bamboo Mattress Protector is designed to safeguard and offer a shield to your mattress against getting wet from fluids and spills. The protector is ideal for a broad-spectrum of protection. It features excellent quality of seam construction and the fabric is highly water resistant. Bamboo operates as the agent for cooling the surface of the protector. The water-resistant Bamboo Mattress Protector provides complete protection from dust mites and other insects like bed bugs. It is an excellent product for people who are prone to skin reactions. The protector traps the dust mites and offers you trouble free sleep. It safeguards and increases the life of your mattress. The design of the Waterproof Bamboo Mattress Protector is elegant and has pockets that are easy to fit into thick mattresses. The waterproof technology prevents the entry of all the liquids, including body fluids like sweat, urine, and other spills and does not let it get absorbed through the mattress. The material of the protector is free from Polyvinyl chloride and vinyl constituents and considered safe for children and pets. The protector is easy to wash in washing machines and can be dried in the dryer of the machine. The waterproof technology pushes out all the liquids including body fluids like sweat, urine, and other spills without letting it get absorbed through the mattress. The protector has a layer of waterproof fabric. The bamboo operates as a cooling means. 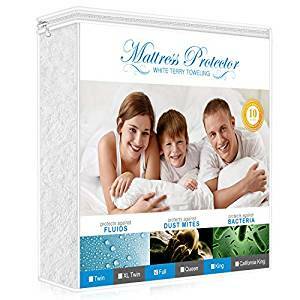 Waterproof Bamboo Mattress Protector provides complete protection from dust mites, bed bugs and is excellent for people who are prone to skin allergies. The protector entraps dust mites and offers allergen-free sleep atmosphere for you. Fit: The design of the Waterproof Bamboo Mattress Protector is stylish and the profound pockets are easy to fit into the mattress of up to 16 inches depth. The protector is easy to wash in the washing machine and can be tumble dried. It is cleaned using normal household detergents. Avoid the use of bleach and dry cleaning agents. Can be machine washed and dried in the dryer of the machine. Bamboo operates as a cooling agent. Produces crinkles and disturbs your sleep. The UltraPlush Premium King Size Waterproof Mattress Protector is excellently soft and fully waterproof in nature. It offers protection to your mattress from getting wet by spills, fluids from accidents. The product comes with a 20-year replacement warranty. The mattress protector provides protection against dust mites, bed bugs and other micro-allergens make it skin friendly for users having diseases like asthma or eczema. The product is made with highly soft and noiseless materials. It allows the users to have a sound sleep without any disturbing sounds while moving and changing positions. It has much softer and more comfortable feel compared to the terry cotton cloth protectors. It lets you enjoy the feel of your original mattress. It also offers a barrier from liquids that are thicker and is claimed to offer nearly 65 percent greater protections than other available standard protectors. It offers a barrier from liquids that are thicker and is claimed to give up to 65 percent more protection than other available standard protectors. The UltraPlush Premium King Size Waterproof Mattress Protector can be used easily with a wide range of mattress brands. The protector provides defense against dust mites, bed bugs and other micro-allergens making it skin friendly for users with a disease like asthma and eczema. It is much softer and more comfortable compared to the terry cotton cloth protectors. It lets you enjoy the feel of your mattress. The product is designed with new, highly soft and noiseless materials. It lets the users have a sound nap without any disturbing sounds while moving and changing positions. The UltraPlush Mattress Protector comes in fitted sheet style that can be adjusted to mattresses of thickness range from 9 inches up to 18 inches thick. The protector can be washed and dried using normal household detergents. Avoid using bleach and dry cleaning. Makes users sweat if sleep for few hours. The surface is comparatively hotter and is not comfortable. The Premium Waterproof Hypoallergenic Mattress Protector from HARMONY DREAM – Non-Vinyl, King Size is just an ideal protector for anyone who has just purchased a new mattress. It lets the user enjoy the breathability as well as the comfort of the mattress while not letting allergens, dust mites, bed bugs, urine, fluids, etc. get into the mattress. 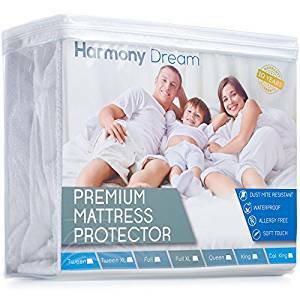 The Premium Waterproof Hypoallergenic Mattress Protector from HARMONY DREAM – Non-Vinyl, King Size has been designed as a waterproof mattress protector as it has the ability to stop any type of moisture like fluids, urine, water, etc. from getting into the mattress. In the absence of such moist materials, it is not possible for bacteria, dust mites, etc. to grow on the mattress. The Premium Waterproof Hypoallergenic Mattress Protector from HARMONY DREAM – Non-Vinyl, King Size has been manufactured out of hypoallergenic terry-cotton which is very beneficial as it protects against dust mites as well as allergens and skin irritants. In the absence of such a protection, almost a million microscopic mites can get into the bed as per studies. It is made out of 80% cotton and 20% polyester. The two fibers combine their strength to make it breathable, soft and hypoallergenic. The Premium Waterproof Hypoallergenic Mattress Protector from HARMONY DREAM – Non-Vinyl, King Size can also be washed along with sheets in the washing machine. The protector gives a very sleek look and enhances the life of the mattress it covers. The mattress protector is extremely durable and for this reason, it is easy to care for as well. The mattress protector is waterproof and does not let any type of liquid get into the mattress. The protector is highly breathable and soft despite being strong and hypoallergenic. The protector is very easy to maintain and is machine washable. If liquid stays on it for a long time, there is a possibility of it getting through. The Premium waterproof hypoallergenic noiseless mattress protector from FRESHFIT, Comfortable vinyl free protection from allergens, dust mites, fluid spills and perspiration, TWIN size, Free Bonus Included is an ideal mattress protector for those people who want to wake up cool and dry in the morning instead of waking up in a hot sweat. It offers a great level of protection to the expensive mattresses that the users have and prevents accidental spills, sweat, and pet-related liquids from getting into the mattress. 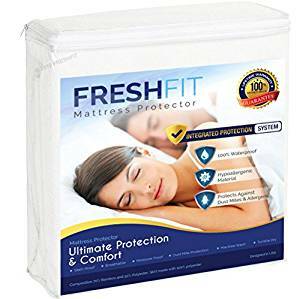 The Premium waterproof hypoallergenic noiseless mattress protector from FRESHFIT, Comfortable vinyl free protection from allergens, dust mites, fluid spills and perspiration, TWIN size, Free Bonus Included is 100% waterproof and does not let liquid spills, moisture, pet-related liquids, etc. from getting into the expensive matters. Thus giving a sense of extreme cleanliness to the mattress and the user’s bed. The Premium waterproof hypoallergenic noiseless mattress protector is made out of such material as ultra-thin membrane fabric which is extremely quiet and does not make any rustling sound allowing the user to enjoy the quietness in the night and sleep comfortably even if the user is in a camp, RV, tent, etc. Moreover, the natural and Luxurious Natural Bamboo Terry material with no phthalates or PVC, etc. protects against bacteria, mold, dust mites as well as other allergens. The Premium waterproof hypoallergenic noiseless mattress protector from FRESHFIT, Comfortable vinyl free protection from allergens, dust mites, fluid spills and perspiration, TWIN size, Free Bonus Included has got elastic fitted sheets which means that the user does not have to struggle to keep adjusting them all the time. The mattress protector is very easy to launder in the washing machine in either warm or cold water preferably with a gentle and delicate setting on the machine. A bleach-free detergent is just ideal so that waterproofing is not damaged. It can be tumble dried after washing with the setting on low-heat. High heat needs to be avoided. It is recommended not to get it dry cleaned or ironed. It is hypoallergenic and anti-bacterial. The protector is extremely easy to maintain. No information is available on trial or warranty period. 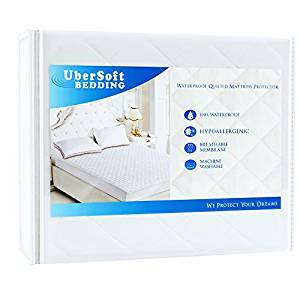 The Mattress Protector Pad for Queen Bed from UberSoft Bedding, Cover is Hypoallergenic and Waterproof for Accidental Spills, Enuresis, Bed Wetting with Deep Pockets. Queen Size allows the user to sleep throughout the night without any worries related to accidental spills knowing very well that the mattress is fully protected. The dust mites and allergens are fully repelled by this hypoallergenic mattress protector. The Mattress Protector Pad for Queen Bed from UberSoft Bedding, Cover is Hypoallergenic and Waterproof for Accidental Spills, Enuresis, Bed Wetting with Deep Pockets. Queen Size is totally waterproof and does not let the sweat or accidental spills bother the user in the night enabling a very comfortable and deep rest throughout the night. The Mattress Protector Pad for Queen Bed from UberSoft Bedding, Cover is Hypoallergenic and Waterproof for Accidental Spills, Enuresis, Bed Wetting with Deep Pockets. Queen Size provides a high-quality due to the materials used in its construction. It is a multi-needle quilted mattress topper which means that it possesses extra durability as well as protection which can be trusted. The Bed padding top of the protector is 100% quilted. The Mattress Protector Pad for Queen Bed from UberSoft Bedding, Cover is Hypoallergenic and Waterproof for Accidental Spills, Enuresis, Bed Wetting with Deep Pockets. Queen Size which is a 60 x 80-inch pillow-top mattress pad boasts a skirt that very easily stretches to accommodate mattresses that are as deep as 18 inches and it still maintains its perfect shape and fit. The Mattress Protector Pad for Queen Bed from UberSoft Bedding, Cover is Hypoallergenic and Waterproof for Accidental Spills, Enuresis, Bed Wetting with Deep Pockets. Queen Size is very durable and is therefore easy to maintain. It can be machine washed with cold water in gentle setting and can be tumble dried at low heat. It is not recommended to iron or dry clean it. It is extremely durable and strong. It is hypoallergenic and repels allergens. It has got a 30-day refund program. The mattress protector might not sustain large spill of liquid which stays on it for long. 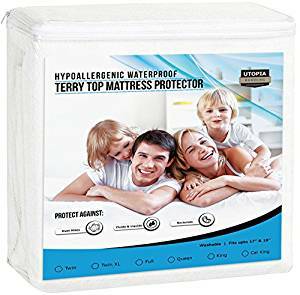 The Premium Hypoallergenic Waterproof Mattress Protector from Utopia Bedding, Breathable Fitted Mattress Cover, Vinyl Free, Queen Size is ideal for mattresses with dimensions of 60 inches by 80 inches by 19 inches. It has got deep fitted pockets as well as professionally turned hems. It is extremely cozy, soft, breathable and totally noiseless. 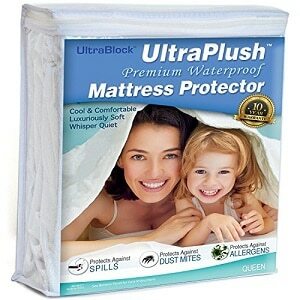 The Premium Hypoallergenic Waterproof Mattress Protector from Utopia Bedding, Breathable Fitted Mattress Cover, Vinyl Free, Queen Size has got a waterproof top and very high-quality construction which impedes water and urine from going through and also preserves the mattress from dust mites and other harmful bacteria and allergens. It lets air through but stops the liquids. The Premium Hypoallergenic Waterproof Mattress Protector from Utopia Bedding, Breathable Fitted Mattress Cover, Vinyl Free, Queen Size is made out of a blend of terry cotton enabling stain and moisture protection. The terry toweling is instrumental in providing a layer which absorbs any moisture and wicks it away from the body of the user during the night. This lets the moisture evaporate and the protector dries out very quickly. The Premium Hypoallergenic Waterproof Mattress Protector from Utopia Bedding, Breathable Fitted Mattress Cover, Vinyl Free, Queen Size features a ‘Smooth Grip Skirt System’ which enables the protector to fit mattresses as deep as 16 inches. It contains elastic which pulls in the borders and stretches it to fit easily to the base of the mattress. It is just like fitting a sheet which wraps around the user-mattress. The Premium Hypoallergenic Waterproof Mattress Protector from Utopia Bedding, Breathable Fitted Mattress Cover, Vinyl Free, Queen Size is preferably machine washed and dried before even using it for the first time. Both cool or warm water can be used and a bleach-free mild detergent is utilized. The user just needs to ensure that the mattress protector is unzipped before washing and that its waterproof back is facing inwards. Bleach or fabric softeners should not be used on this protector while washing. It can be air dried or tumble dried at low heat. Terry toweling wicks away unwanted moisture. ‘Smooth Grip Skirt System’ ensures proper fit. The mattress topper is very easy to maintain. The waterproofing capability might infringe on the ability to be perfectly breathable. The Full-Size Mattress Protector from AdorioPower, Hypoallergenic and 100% Waterproof Cover Cotton Terry Surface, Machine Washable, Vinyl-Free Breathable, Machine Washable, White is ideally suited to provide a high level of protection to the users for a perfectly comfortable and deep night’s rest enabling the user to wake up fully energized the next morning. The topper is extra-thick and this helps total bug protection. It is extremely easy to install and fit and enables a calm and undisturbed sleep throughout the night. The Full-Size Mattress Protector from AdorioPower, Hypoallergenic, and 100% Waterproof Cover Cotton Terry Surface, Machine Washable, Vinyl-Free Breathable, Machine Washable, White is waterproof and breathable at the same time. It allows the air to pass through to increase air circulation to keep the user cool but stops the liquids from going through. It keeps the user’s bed cool and dry and boasts a polyurethane barrier which protects the user’s mattress from liquids and fluids. The Full-Size Mattress Protector from AdorioPower, Hypoallergenic, and 100% Waterproof Cover Cotton Terry Surface, Machine Washable, Vinyl-Free Breathable, Machine Washable, White has got a surface that is made out of terry cotton which wicks away the moisture and the sides are made out of polyester knit. The surface also contains a polyurethane barrier to provide perfect protection against liquid spills. The mattress topper does not contain any PVC, phthalates, vinyl, or any other toxic chemicals. The Full-Size Mattress Protector from AdorioPower, Hypoallergenic and 100% Waterproof Cover Cotton Terry Surface, Machine Washable, Vinyl-Free Breathable, Machine Washable, White has got a polyester 75D side skirt which is specially designed to fit any user mattress which is up to 14 inches deep. The protector also features a fitted sheet style as well as an elastic band design to wrap the protector around the mattress very securely. IT is very easy to install or conversely remove for the purpose of laundering. The Full-Size Mattress Protector from AdorioPower, Hypoallergenic, and 100% Waterproof Cover Cotton Terry Surface, Machine Washable, Vinyl-Free Breathable, Machine Washable, White is extremely easy to maintain. It is recommended to machine wash before first use. Ironing and bleaching need to be avoided. It is machine washable in cold water with mild detergent on a gentle setting. Similarly, it is tumble dried on low setting. Harsh chemicals must be avoided. It has got an extra-thick surface. It is totally waterproof but still breathable. It is very easily maintained. Even though you think that your mattresses are safe and clean by running a vacuum cleaner over your mattress once in a while, yet it may not be the most effectual way of maintaining your mattress the way it should be. A mattress protector essentially builds a barricade between you and dust mites, bugs etc living in your mattress. The mattress protectors can be of various types that are discussed above. When you are out to buy mattress protectors for your mattresses for backpain or any ordinary mattresses, make sure you check out the features like size, fabric, thickness, thread count, type of anti-allergenic material used, and pore size of the material. The fabric of most of the mattress protectors is either of cotton, synthetic, polyester, vinyl or a blend of different materials. The plethora of benefits that Mattress protectors offer, make them a great option for those who want to protect their quality mattresses. They just not only offer additional comfort and support, mattress protectors also provide protection from dust mites, organisms causing skin allergies, dirt and stains, and bed bugs. They also keep the mattresses dry and prevent them from bed-wetting by fluids. To enjoy the maximum benefits from a mattress protector, find a protector which is skin-friendly, breathable, easily washable, and protect you from bugs, dust mites, and wetness.